The BeeKay Theater was opened in 1936 by Louis Kanstein and Frank Baumgart. Harry Beauford was the main projectionist. This year, Tehachapi Community Theater celebrates its 50th anniversary with 50 years of creative people planning, rehearsing, singing and joyfully presenting plays and musicals for the entertainment of our community. For many years, TCT continuously presented wonderful theater in such places as Wells Auditorium, Tehachapi Academy of Performing Arts, the Stallion Springs Community Center, Mama Hillybean’s Coffee House (now Red House BBQ) and even Jacobsen Middle School. It was Dec. 6, 2008, when the ribbon-cutting took place for the BeeKay Theater, and during that month, TCT opened the theater with the musical “Oliver.” This wonderful, rebuilt building has become a beautiful, comfortable and prestigious venue to be the home for all of TCT’s productions. The cost for production has risen over the years (as everything seems to do). Obtaining the rights to plays and music scores is quite costly. Building working sets for each production, costuming the actors, bringing in the right props, all cost money. We are proud of the support which we’ve had from our community. Fifty years is nothing to take lightly. 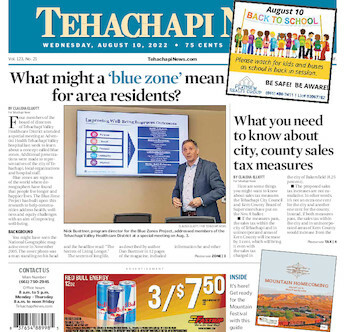 However, we find that with the population growth in Tehachapi and the increasing sophistication of our residents, the demand for better-known productions and excellent quality theater grows too. Since we don’t have the ability to add more seats in the theater, we need to find other ways to fund our growing needs. In that respect, we are asking for business owners, companies and individual or family donors to sponsor a play. The most recent production of "Young Frankenstein" was sponsored by The Tehachapi Apple Festival. As the organizer of that event, it gave me great pride to be able to put money into the arts and support one of the most fun, well attended and delightful productions from TCT. We encourage you to reach out to us to become a sponsor of an upcoming production. If we reach out to you, we hope you will be receptive to our passion and pitch. The remaining production for this season is "The Foreigner," a fun, two-act comedy which takes place in a fishing lodge in rural Tilghman County, Georgia. Guests believing that one of the lodgers is a “foreigner” who does not speak any English begin divulging their secrets. The next season will include such productions as the musical comedy "Nunsense," "One Flew Over the Cuckoo’s Nest," "Trip to Bountiful" and "Little Women" (not necessarily in that order). Linda Carhart is a member of the Tehachapi Community Theater and organizer of the Tehachapi Apple Festival. Mark your calendar to join the celebration of 50 years of theater as Tehachapi Community Theater hosts its Gala – Night of A Hundred Stars on Oct. 19. More information will be available soon. Contact Linda Carhart at 818-519-7144 or Fran Riggs at 823-4501 for sponsor opportunities. You can also go to tctonstage.com to make a donation, become a member, see what’s coming and get more information.